Golden Retrievers Are the Best! If you’ve ever heard anyone say that golden retrievers are great family dogs, they probably speak from experience. If you want a watchdog, you might as well forget it because anyone that enters your house will get a cheery welcome and will be asked to play. The golden is “a dog with winning warmth and limitless love.” The word “golden” was derived from the color of their coats, coats that can come in many different shades. If you live in an apartment, this may not be the dog for you because they are large and also very energetic. The male golden can “range from 23 to 24 inches (58 to 61 centimeters) high at the shoulder” and can weigh in “between 65 and 75 pounds (29 to 34 kilograms.) They definitely aren’t tiny, but they have a heart that seems to be as big as their bodies at times. They are an active dog who enjoys swimming and will like things like playing Frisbee, running or hiking with you. Originally they were bred as hunting dogs in Scotland during the 1800s and later came to North America. The goldens, who were discovered to be “great family pets” also have been known to be wonderful guide dogs, service dogs, therapy dogs and search dogs. You will read about a golden retriever named Bear who “searched for people who were trapped beneath the World Trade Center’s rubble.” From family pet ‘n friend to hero, this dog seems to have it all. In this book you will read about its physical characteristics, the history of the breed, the different uses or ways the golden has been put to work, the needs of the dog (is it right for your family? ), what to do when you bring your dog home, a list of supplies you will need, the necessity of good veterinarian care, how to feed your dog and basic care. 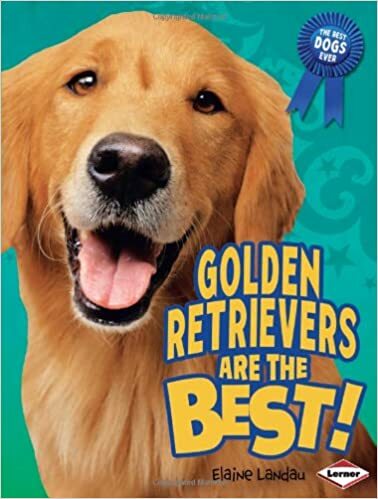 This vibrant, animated book provides an excellent overview of the golden retriever. The book not only points out the pluses to the dog, but also indicates the reasons a family might not be able to deal with one. For example, if you are a couch potato, this highly energetic breed might not fit in with your lifestyle. I loved the numerous photographs that pepper the pages of this book because it paints a great portrait of the personality of the breed. The book has several informative scattered sidebars that give addition information on the golden. If you decide to actually purchase a golden retriever you will need an additional book on how to care for one, but this book just may help you decide if you want to add one as a family member. In the back of the book is an index, a glossary, and additional recommended books and website resources. Quill says: You may just fall in love with Golden Retrievers after reading this book.